Unlike 2012, the BJP finally has some competition in Gujarat. Jignesh Mevani, Hardik Patel, and the BJP itself are factors behind it. What is the difference between this state election in Gujarat and the last one in 2012, I asked Farzana Shaikh, a school teacher in Ahmedabad. “This time it is an election,” Shaikh said, with a wide smile. Shaikh was rooting for the Congress to win, or at the very least, for the BJP to dip below 100 seats. After it emerged that the BJP would likely cross 100 seats, Shaikh still seemed optimistic. “At least there are finally rumblings,” she said Monday afternoon. Having been in Gujarat during the 2012 state elections, as well as for the Lok Sabha elections in 2014, I feel a palpable difference in Ahmedabad today. In 2012, I watched a man riding a bicycle with a large Congress advertisement shoved and pushed to the ground right outside a popular tea stall here. When I and several others ran to help him, supporters of the Bharatiya Janata Party told us the cyclist had no right to oppose then-Chief Minister Narendra Modi. In some ways, that climate still remains. A popular stand-up comedian in Ahmedabad, who jokes on everything from condoms to menstruation, told me Saturday night that the only topic she will not discuss is Modi. But at a political level, we are, finally, seeing a return to politics in Gujarat. Sure, the Congress party might be inept and guilty of playing its own soft Hindutva card, but at least the Congress party is not completely laughed at and dismissed in Gujarat, as it was in 2012. Fans of democracy should cheer this change, regardless of whom they support. There are many factors behind this change, only a small portion of which can be credited to new Congress president Rahul Gandhi. After Modi became Prime Minister in 2014, many members of the BJP in Ahmedabad told me they were eager to step into the spotlight, to leave their own mark on Gujarat. It is debatable whether or not this happened, and the short, disastrous tenure of Chief Minister Anandiben Patel shows that the BJP is still learning how to give people in its party not named Modi a chance to flourish. But a curious thing about living in Ahmedabad is that after all the digital recorders and cameras are switched off, many close associates of Modi in Gujarat tell me they are waiting for the chance to shape the BJP in their own image, and not that of Modi. Whether or not this happens now, given the BJP’s reduced vote, remains to be seen. Another factor is that Modi is no longer the only aspirational political figure in Gujarat. In 2014, the rise of the Aam Aadmi Party created a remarkable opening to challenge the BJP on development and corruption, two issues most Gujarati voters think Modi has been flawless on. I saw this when Arvind Kejriwal held a rally in Ahmedabad in 2014. He followed his own script and took Modi to task on issues like farmer suicides. Never mind that Kejriwal had many of his facts wrong. It was the way he spoke, his supporters told me, directly and forcefully, that they respected. Onlookers began throwing rocks on the stage as Kejriwal spoke, a point AAP supporters only used to grow their base, as if to say: look, we are the real bold leaders in Gujarat, not Modi. Of course, the Aam Aadmi Party has imploded since, but many of the candidates we see today in Gujarat—the victorious Dalit leader Jignesh Mevani, for example—cut their teeth as AAP workers, and found their political support base during that time. To be fair, the Congress party deserves a bit of credit, too, for widening the political debate in Gujarat. Much has been written about how it attacked Modi on issues like minority rights in 2012, but those comments often came from the Congress’s national leaders, and not from local Congress candidates, many of whom were shifty and devoid of ideas. In contrast, BJP candidates spoke the way Gujaratis appreciate: unafraid, unwavering, and muscular. But this time, there has been a shift in the Congress party. 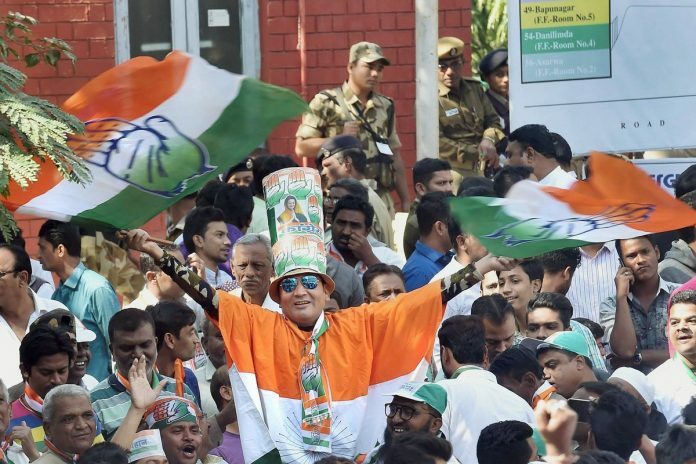 In the upscale neighborhood of Prahaladnagar in Ahmedabad, Congress candidate Mihir Shah, who ended up losing to BJP incumbent Kishor Chauhan, said he made it a point to open a Congress office right opposite the BJP office. Sure, the Congress office was dilapidated and often relied on free Gujarati snacks to lure visitors, but as Shah told me, at least it was of equal size to that of the BJP. Another factor is Hardik Patel. The numbers show that not as many Patel voters switched their allegiance from the BJP to the Congress, but he remains a bold new voice in Gujarat. At Patel’s road show last week, a young supporter told me he was smitten by the sight of Patel, waving to the crowd, hanging out of an SUV. Modi had long held that image, of the wide-chested, fashion-forward, youth-loving leader, who could stir emotions and draw a massive crowd. Today, Modi has a bit of competition for that role. But the biggest factor, ironically, might be the BJP itself. Though Modi tried again and again to bring up the communal divide, voters—especially in rural Gujarat—pushed back and demanded the party speak about issues like GST, farmers’ income, and demonetisation. I even met an RSS cadre who voted for the Congress this time because he wanted the BJP not to “take his vote for granted”, and “actually speak about things”. I don’t know what was more surprising—the fact that he voted this way or the fact that he felt comfortable enough to admit this in public. That might be the biggest takeaway from this election: in this most saffron of states, there is, finally, a bit of suspense again. Zahir Janmohamed is a Senior News Editor at Hyphen magazine.